The total land area of the Philippines is approximately 30 million ha. As of 1997 the actual forest cover was about 5.4 million ha or 18 percent of the total land area of the country (Table 1). The dipterocarp forests still are the most important ones, accounting for 66 percent of the forest cover. Old growth or virgin forests cover about 0.81 million ha, while 2.7 million ha are residual forests. Of the other forest types, pine forests (mainly Pinus kesiya) extend over an area of 0.23 million ha and mangrove forests over about 0.11 million ha. Mossy forest covers about 1.04 million ha (DENR, 1998). Based on the results of the latest inventory reported in 1987 and 1988 (DENR, 1988), the forest cover declined from 13.07 million ha in 1977 to 5.4 million ha in 1997, a decrease of almost 60 percent over a 20-year period. From 1988 to 1997, the decrease was 17 percent. Rattans are naturally found in the Philippine dipterocarp forests and are distributed throughout the country. Four genera, namely Calamus, Daemonorops, Korthalsia and Plectocomia, with 64 species are found in the country (PCARRD, 1991) (see Annex 1). Calamus, with 44 species and 23 varieties, is the largest of the four genera. It is widely distributed, but some species are narrow endemics and confined to specific islands or mountains. Daemonorops is the second largest group of Philippine rattans. There are 14 species and one variety under this genus. Like Calamus, they are widely distributed but many are confined to islands and mountains. Korthalsia consists of only five species. Members of this genus have a more restricted distribution. Three species are only found in Palawan, two species in Mindanao and one species in Luzon, Polillo Island and in Mindanao. Plectocomia has the smallest number of members. It consists of two species. Members of this genus are confined to the primary rainforests of Palawan, Leyte and Mindanao. The only nationwide inventory of rattan resources in the country was conducted from 1983 to 1987 under a Philippine-German forest resources inventory project (DENR). The results of this inventory are shown in Table 2. Limuran, palasan and tumalim are the most demanded species by the furniture and handicraft industries. Not only are they commonly found all over the Philippines, but they also reach a diameter size of 2 cm or more. The combined length of poles of these species of diameter >2 cm was 1.45 billion linear metres or 85 percent of the total resources of this diameter class. Since the inventory was conducted the supply of these species have dwindled. Due to shortage of these prime species, other rattans are now being utilized by the industry. No inventory of rattan resources was carried out after 1988. However, an estimate of the resources was made by the National Resources Accounts Programme in 1997 (NRAP, 2000). The estimate was based on net stand growth, reduction due to harvest, wastes and deforestation (Table 3). The NRAP estimated that in 1997 the total stock was 5 607 million linear metres (mlm). This is a much higher figure than the one indicated in the 1988 inventory (4 573 mlm), considering the significant decrease in the dipterocarp forest cover which occurred from 1988 to 1997. Another way of estimating the available rattan resources of the country is by using the annual allowable cut (AAC) of rattan licensees. DENR Administrative Order No. 04 Series of 1989 (dated 10 January 1989) prescribed the computation of sustainable AAC for rattan cutting permits.6 With AAC, the rattan density in a given licence area can be estimated which, in turn, is used to determine available stock in the same area. Table 4 shows estimated rattan resources using this method. Using the above method, it is estimated that there are 1 490 mlm of rattan on the 1.78 million ha of licence areas. This is a low estimate considering that there are at least 3.54 million ha of dipterocarp forests. However, it provides the lower point in the estimate of rattan resources of the country while the NRAP calculation (5 608 mlm) provides the upper point of the estimate. With respect to diameter classes, it is estimated is that a maximum of 40 percent of the total resources belong to the 2 cm and above class, while a minimum of 60 percent belong to the less than 2 cm diameter class. The Philippines has some experiences in rattan plantation development, albeit on a small scale. In Ifugao Province Calamus manillensis, a solitary large-diameter rattan, is widely cultivated in home gardens for its fruits, which are edible and used as a cure against coughing (Fernando and Palaypayon, 1988). Small rattan farms integrated in agro-forestry farms (2.27 ha in Aklan Province and 4 ha in Capiz Province) in Panay Island have also been documented. Species planted were palasan, limuran, sumulid (Daemonorops ochrolepis), ditaan (D. mollis), C. dimorphacanthus var. halconensis and C. vidalianus. Harvests, however, were not monitored since the rattans were mainly for household use. Outside sales were only occasional (Fernando and Palaypayon, 1988). In 1983 the National Development Corporation (NDC) jointly developed with the Paper Industries Corporation of the Philippines (PICOP) a 4 000 ha rattan plantation in Mindanao. Palasan was planted under bagras (Eucalyptus deglupta) and falcata (Paraserianthes falcataria) plantations (Formoso, 1988). There is no record of the volume harvested. The Government encourages and provides incentives for the development of rattan plantations (DENR, 1989). Incentives include reduced rental fees for the plantation area; reduced forest charges; provision of rattan seedlings to developers at production cost; free technical assistance; and the right to harvest, sell, convey or dispose of the rattan in any manner the owner sees fit. Rattan plantations have also been developed under Government projects. Table 5 shows the reported rattan plantations developed under the Forestry Sector Project of DENR. Some of these plantations were established as early as 1989 using mainly palasan and limuran, the two important species for the furniture industry. DENR AO No. 04 governs the allocation of cutting areas through bids, harvesting, annual allowable cuts, and imposition of a special rattan deposit. Individual rattan gatherers, cooperatives, associations, corporations, partnerships, indigenous communities and owners or operators of rattan processing plants are qualified to bid. However, cultural communities have priority over other applicants on areas within their ancestral domain. Licences have a maximum duration of ten years. To ensure sustainability, a sustained yield cut is prescribed (Annex 1) and rattan licensees are required to replant. To ensure such replanting, a special deposit is collected for every linear metre gathered, P 0.57 (US$0.011) for 2 cm diameter or above and P 0.46 (US$0.009) for below 2 cm diameter. The licensee may contract the services of private parties or Government entities to establish plantations using the rattan deposit. The few plantations of rattan established in the Philippines have provided some experiences in the management of plantations. It has been shown that palasan can grow under timber plantation of bagras or falcata, as well as under coconut trees and fruit trees (PCARRD, 1991). In one old plantation, palasan was grown in the open. To establish the parameters for rattan plantation development, trial plantings were initiated in 1977 in Quezon Province using commercial species. Trial plantings were done under different canopy openings, various shade trees and residual forests. Planting materials from seeds and from wildlings were used. About 200 ha were planted with palasan and limuran (Lapis, 1995). Since then several researches have been conducted (PCARRD, 1991). The ecology and phenology of commercial rattan species have been studied extensively (Fernando,1989). Seed collection, processing, germination and nursery cultural practices were also studied. Tissue culture of commercial rattan species was also studied as an alternative source of planting materials (Garcia and Villena-Sanches, 1988). Clones of palasan and limuran were successfully established in nurseries and in the field. Plantation establishment practices were also developed. These included site selection, site preparation, out-planting techniques and plantation maintenance, soil requirements of various rattan species, canopy opening, spacing, weeding and fertilization regimes, as well as the application of mulch during dry spells. Growth and yield studies were likewise conducted for plantation grown rattan as well as for natural stands (Cadiz, 1989). There is very little conscious effort to preserve biodiversity of rattan in the Philippines despite its commercial importance. Biodiversity conservation of rattan would result from broader natural forest conservation. In 1992 the Integrated Protected Areas System (IPAS, RA 7586) was passed into law. It calls for the identification and establishment of IPAS whereby biological resources are protected and preserved. By operation, rattan resources found in the area are likewise protected and preserved. Table 6 shows four protected areas where rare and endemic rattan taxa are found (Lapis, 1995). One strategy for genetic conservation outside the natural habitat of rattan is through a gene bank. In 1983 a gene bank, where local and exotic rattan could be grown, was established in a 5 ha area in Mt. Makiling, in Los Baños, Philippines. Initially, 44 rattan taxa, collected all over the archipelago, were planted in the gene bank (Baja-Lapis and Santos, 1993). Growth accounting of each taxon is being assessed by measuring the length and the number of suckers produced. The limited tenure of the rattan-cutting licence, which is ten years, does not provide an incentive for the licensee to manage the rattan resource sustainably. Neither is the imposition of an allowable cut a guarantee to a sustainably managed resource. The tendency is to gather as much as possible without regard to the succeeding harvest after the ten-year period. To remove this constraint, it has become a policy to transfer all rattan-cutting licensees within community-based forest management (CBFM) areas to the jurisdiction and management of CBFM people's organizations or indigenous communities.7 These communities have a 25-year tenure over the area, renewable for another 25 years. The long tenure and the benefits that communities derive are incentives for them to manage the resources sustainably. The special rattan deposit does not guarantee that plantations will be developed within the cutting area or elsewhere unless it is strictly imposed that licences are terminated if planting is not undertaken in any given year. As it is, only limited plantations have been developed the deposit. In one region the rattan special deposit collected since 1991 now amounts to more than p 25 million (US$555,000), but no plantation has been developed. Instead of collecting the rattan special deposit, the licensee should be required to submit a plantation development plan, submit evidence that an amount equivalent to one-year expenditure for plantation development has been deposited in a bank and that a contract has been entered into with a third party for the development of the plantation. Plantation development should be monitored and no rattan-cutting licensee should be allowed to operate in the succeeding year if the planned plantation development did not become operational. Funds for rattan plantation development are inadequate. The Philippine Government has been able to obtain loans from the Asian Development Bank (ADB) and JBIC for tree plantation development. Rattans are sometimes included in the plantation development, but these are minimal. A loan similar to that for industrial tree plantations at favourable interest rates should be obtained to develop primarily rattan plantations. Government financial institutions should also open a window for private sector development of rattan plantations. The rattan licensee usually engages a contractor who, in turn, hires rattan gatherers. The gatherers are the ones who actually go into the forest, cut the rattan and bring it down from the mountain to the stockyard (Rivera, 1988). The gatherers are paid according to the number of pieces of rattan brought to the stockyard. The price depends upon the species, diameter and length. Rattan poles are bundled and carried down the mountains by the gatherers themselves. Sometimes water buffaloes are used to carry the bundled rattan to the stockyard. At the licensee's stockyard the rattan undergoes scraping, trimming and drying. Often, the rattan poles are treated with preservatives prior to drying. In some cases, the poles undergo splitting. After drying, the poles are sorted according to diameter, length and colour (stained or unstained). From there the licensee distributes the poles to furniture or handicraft manufacturers. There are a number of issues and concerns at various stages in the harvesting, preliminary processing, transport and distribution of the rattan poles. Rattan harvesting is still literally by hand. The stem is cut as close to the ground as possible and is pulled down. Since rattan clings to the canopy, pulling it down is a difficult task. The larger portion of the rattan stem is often left in the canopy as waste. 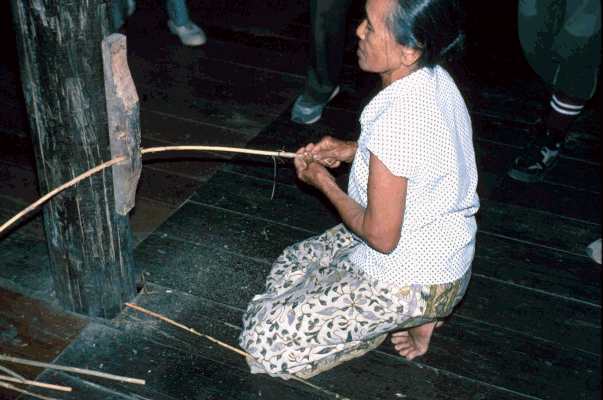 No mechanical devices are used to pull down the rattan to obtain the maximum harvestable length. Often immature stems are cut, which are later rejected by the contractor or the licensee. Since rattan gathering often takes weeks, the poles are left lying on the forest floor and often staining sets in. At the very least, the grade and value of the poles are reduced; at worst, the poles are discarded. Harvesting rattan in the Philippines is generally done during the dry season. From late May to November or December, rattan gathering slows down or even stops except for gatherers who do not have other sources of livelihood. Areas where harvestable rattan is located are now much deeper into the forest, affecting the volume that each gatherer can bring out from the forest and, consequently, his income. Hauling the poles from the cutting area to the roadside is basically manual labour. Since gatherers do not own water buffaloes for carrying the poles down from the forest, they are constrained to minimize their load (Wakker, 1993). Thus poles are cut shorter than the desired length or are split, resulting in a lower value of the materials. When transported, rattan often must pass through a number of checkpoints. In most instances these checkpoints constitute expense points. This increases its price, which is passed on to the buyers. Manual sorting is often inaccurate and leads to re-scaling by Government authorities and the buyers. Hand-scraping is a slow process and often non-uniform. There are no drying facilities at the contractors' or at the licensees' level. Sun-drying is the most common practice, but often leads to staining and damage by borers, thus degrading the materials. A national standard (PNS 229-1999) has been approved in 1999 for rattan poles and rattan by-products. Product standards in the Philippines are not mandatory and the Bureau of Product Standards relies mainly on the acceptance of the standards by the stakeholders. Although acceptable technologies for pole preservation exist, treatment of rattan poles at the cutting area or at the stockyard is seldom practised. This stems from lack of awareness of the importance of treating the materials. Licensees try to avoid the added cost of preservative treatment. However, lack of treatment often results in early deterioration of the poles (Pabuayon and Espanto, 1996). The price and value of rattan poles can be increased by undertaking primary processing at the village level, or at the stockyard of the contractor or the licensee. Primary processing may take the form of trimming, scraping, treating, drying, straightening, grading/sorting and bundling (Wakker, 1993). These operations require minimum skills that could be obtained through training and experience. Another primary processing is splitting. Rattan splits can find beneficial markets from handicraft and large rattan furniture factories. It is labour-intensive and requires little equipment outlay. Communities can also engage in rattan furniture manufacture, but this requires more extensive training. A strategy to pursue is for large furniture manufacturers to contract the production of furniture parts out to the community, which some manufacturers are already doing. Presently, no certification as to the source of the raw materials exists; neither is chain of custody being undertaken in rattan furniture manufacture. But as foreign markets become more discriminating as to whether rattan raw materials come from sustainably managed forests, certification will become a practice. In the Philippines there is no certification even for wood products. The National Statistics Office (NSO) is responsible for collecting and collating trade data. These are collected from line agencies such as the Bureau of Customs, Bureau of Domestic Trade, Bureau of Export Trade Promotions, the Department of Trade and Industry and from other Government agencies concerned. DENR is responsible for data on natural resources harvesting and production, as well as for analysis of data on production and trade of forest products. In 1999 (Table 7) the share of rattan furniture in the total furniture exports from the country was 32 percent with a value of US$112.89 million, while that of wood furniture was 38 percent with a value of US$132.67 million. Since 1990 the value of rattan furniture exports has been swinging up and down despite the 6.4 percent growth rate of the entire furniture industry. The United States is still the most important foreign market for rattan furniture from the Philippines. The value of imports in the United States in 1998 was US$53.67 million or 50 percent of the total export value. Other major markets are Japan, Great Britain, Australia and France. The greatest barrier to a better position of the rattan furniture industry in the export market is the decreasing supply of rattan of the right size and quality. The production of rattan poles during the last five years has been decreasing rapidly (Table 8). The requirement for the production of exported rattan furniture in 1998 was estimated at 36 to 108 mlm8. Production of rattan in 1998 was only 10.46 mlm. For the same year the country imported only 112,973 kg of rattan poles, equivalent to 9,400 poles (112,000 lm). Total production and imports of rattan poles fell far short of the amount used by the industry in 1998. Either these were under-reported or the actual values were not captured in the surveys. In any case, demand far exceeds supply. As of 1996 rattan licence areas within CBFM and those within ancestral lands are no longer put out to tender, but would be operated by the CBFM community or the ancestral community (DENR, 1989). This way the upland communities can benefit from the rattan resources in their areas. In the present set-up, where rattan gatherers are engaged by contractors or licensees to harvest rattan, minimal benefits accrue to them. It was estimated that in 1996 the gatherers received only about 25 percent of the traders' price for large-diameter rattan, while they got about 36 percent from small poles (Pabuayon and Espanto, 1996). In 1998, the price at the source (gatherers) for 2 cm diameter rattan and above was only 17 percent of the traders' price, while it was about 20 percent for small-diameter poles (Rivera, 1998). In terms of finished products, only 5-21 percent goes to the gatherers, while 63-87 percent of the value of the products goes to manufacturers (Pabuyon and Espanto, 1996). There is a need to add value to the rattan poles prior to delivery to the contractor or licensee in order to improve the benefits that accrue to the gatherers. A recommended approach to providing more benefits to the gatherers and their communities is to undertake primary processing and eventually progress into production of furniture parts in joint ventures with furniture manufacturers. Responsibility for direct resource management and conservation/utilization rests with rattan licensees. DENR provides general supervision over the licensees. Rattan licensees are required to submit an annual cutting and replanting plan. The replanting plan is implemented through the payment of a Rattan Special Deposit. Actual planting may be done through organizations or groups sub-contracted by the licensee. For the CBFM communities, replanting is undertaken according to an annual resource management plan submitted and approved by DENR. Rattan plantation development outside of the license areas is provided for by Government policies (DENR, 1989). However, there is no vigorous Government rattan development programme comparable to that for industrial tree plantation development where financing is provided. In Government reforestation programmes, rattan plantation development is but a small portion of the total area developed. To ensure future rattan supply, the Government should mount a vigorous rattan plantation development programme. Sufficient incentives should be provided for both smallholder and large-scale plantation development. 1. Production of quality planting materials in sufficient quantity and at reasonable cost. Tissue culture would be an excellent alternative if only the cost of the seedlings could be greatly reduced. 2. Nursery management is also an important aspect of the technology that must be developed particularly in pest and disease management. 3. Growth and yield data of important commercial species such as palasan, limuran and tumalim should be established. For the manufacturing sector, the Government should continue to provide assistance in product development, waste reduction (such as in pole drying and treatment) and waste utilization. The Government is now assisting furniture exporters through the organization of international furniture trade fairs. The Government in cooperation with the private sector should provide marketing assistance through the Internet. 7. incorporate in DENR policies and guidelines considerations for certification of sustainably managed rattan resources and plantations. 7. Government should take concrete steps to provide financing for rattan plantation development in the same manner as it is doing for industrial tree plantations. Baja-Lapis, A. & Santos, G., 1993. Establishment of rattan gene bank - a Philippine experience. Post paper presented in the International Symposium on Genetic Conservation and Production of Tropical Forest Tree Seed held in Chiangmai, Thailand, 14-16 June. 18 pp. Unpublished. Cadiz, R.T., 1989. Growth assessment of rattan in existing natural stands and man-made plantations. Los Baños, Laguna. PCARRD-IDRC Terminal Report. DENR. 1988. Natural forest resources of the Philippines. Philippine-German Forest Resources Inventory Project, Forest Management Bureau, Department of Environment and Natural Resources. DENR. 1989. Revised regulations governing rattan resources. AO No. 04 Series. DENR. 1998. Philippine Forestry Statistics. Forest Management Bureau, Department of Environment and Natural Resources. DENR. Rules and regulations for the implementation of Executive Order No. 263, otherwise known as the Community-based Forest Management Strategy. DAO No. 96-29. Fernando, E. S., 1989. Phenology of the commercial species of Philippine rattans. Terminal Report. College, Laguna. Fernando. E.S., 1990. A preliminary analysis of the palm flora of the Philippine Islands. Principes 34: 28-45. Fernando, E.S. & Palaypayon, W.R., 1988. Small-scale rattan farming: Notes on a case study of two sites in Panay. Proceedings of the National Symposium/Workshop on Rattan. Cebu City, 1-3 June 1988. Formoso, G.R., 1988. Economics of rattan plantation development. Proceedings of the National Symposium/Workshop on Rattan. Cebu City, 1-3 June 1988. Garcia, M.U. & Villena-Sanches, E., 1988. Tissue culture of rattan: Progress and prognosis. Proceedings of the National Symposium/Workshop on Rattan. Cebu City, 1-3 June 1988. Lapis, A., 1995. Rattan genetic resources in the Philippines. UNDP/FAO Regional Project on Improved Productivity of Man-Made Forests through Application of Technological Advances in Tree Breeding and Propagation (FORTIP). Los Baños, Philippines. NRAP. 2000. Rattan resources accounting update. In: Forest resources accounts update, 1989-1997. ENRAP 4 and FMB-PEENRA Counterparts. Pabuayon, I.M. & Espanto, L.H., 1996. The Philippine rattan sector: A case study of an extensive production system. Bamboo and Rattan Seminar/Workshop, 28 June 1996. Sponsored by INBAR. PCARRD. 1991. The Philippines recommends for rattan production. Philippine Council for Agriculture, Forestry and Natural Resources Research and Development. Department of Science and Technology. Rivera, M.N., 1988. Marketing system and price structure of rattan raw materials in the Philippines. Terminal Report. Ecosystems Research and Development Bureau. DENR. Wakker, E., 1993. Towards sustainable production and marketing of non-timber forest products in Palawan, the Philippines. Haarlem (The Netherlands), Tropical Social Forestry Consultancies (TSF). Statenbolwerk 16. C. subinermis H.A. Wendl. Ex Becc. D. margaritae (Hance) Becc. var. palawanica Becc. 6 SYC = [A x D x f]/r where: SYC is sustained annual yield cut in lineal meters; `A' is the forested area of rattan license; `D' is the average density per hectare in lineal meters; `r' is the rotation period which is 10 years; and `f' is the recovery factor which is 85 percent. 7 DENR DAO No. 96-29. Rules and regulations for the implementation of Executive Order No. 263, otherwise known as the Community-based Forest Management Strategy. 8 According to the Chamber of Furniture Industries of the Philippines, a lineal meter of rattan pole (2 cm or larger in diameter) will fetch an export value from US$1.0 to US$3. 9 DENR MC No. 15, Series of 1990. Updating of Cost Estimates for the Establishment of Rattan Plantation by Contract and Administration; DERN MC No. 18, Series of 1990. Prioritizing the Establishment of Rattan Plantation by Contract and Administration and Exploring the Possibility of Availing Management and Technical Services Agreements with Plantation Developers and other schemes; DENR MO No. 11, Series of 1990. Prescribing Guidelines for the Movement/Transport of Finished and Semi-Finished Rattan Forest Products.